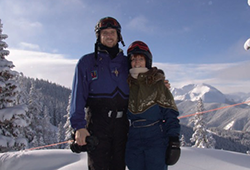 Jerri Barden Perkins enjoys extreme skiing with her son, JC "Jack" Perkins Jr.
Jerri Barden Perkins, M.D. did not venture outside her home state of Virginia until she was a junior at Mary Washington. She has since made up for lost time with extensive and enlightening travel adventures. These experiences prompted her to make arrangements in her estate plans to encourage UMW students to broaden their horizons through liberal arts classes, research projects, and participation in study abroad programs. "If I had my way, it would be mandatory for every American to study outside the U.S.," she says. "It's so important to see how other people live and thrive." As a student at Mary Washington, Jerri focused on science classes while pursuing her dream of becoming a physician. She majored in chemistry and valued pre-med classes in comparative anatomy and histology; however, she says her liberal arts classes impacted her life and career in ways that continue to surprise and delight. Jerri continued her education at Medical College of Virginia and completed a post-doctoral fellowship at the National Institutes of Health. There she discovered an interest in research and helped rediscover and name an organism – the JB Strain – now located in the American Tissue Culture Collection. Her career path changed slightly as she began work for the Food and Drug Administration. Jerri's medical research and consultation assignments often blended with her private life, especially during her 38-year marriage to John Calvin "Cal" Perkins. A graduate of Harvard University and Harvard Medical School, Cal practiced internal medicine with a specialty in infectious diseases. "He was attuned to nature, had a poet's mind, the intellect of a scholar, and the brawn of an athlete," Jerri says. The couple and their children enjoyed travel. As a consultant for the prevention of AIDS, Jerri's work took her to Paris, Montreal, and Florence. Through the years, the family skied in Switzerland, went on Safari in South Africa, visited the pyramids of Egypt, and sailed the Nile. One of their most memorable adventures was a literal trip around the world by private jet. "Travel has always been special for me, and I loved the incredible sights and the educational experiences," says Jerri. "But I could not overlook the third-world poverty we saw. That really affected me." Jerri and Cal were not new to the plight of those less fortunate. For nearly 20 years, they utilized their medical expertise as volunteers and board members for a free clinic. "If you are blessed to have done well with the education provided to you, I think you have an obligation to pay it back or to pass it forward," Jerri says. Cal passed away in 2009, and Jerri now is honoring his life by continuing to help others. "He made the world better for me and for all," she says. "We educated our children and gave them our values. Now, I want to do something in his memory that will be meaningful and that will last for generations." As a member of the UMW Heritage Society, Jerri has made provisions for five endowments: a Washington Scholarship, a science scholarship, a study abroad scholarship, a summer science research endowment, and an endowment for research in classics, philosophy, and religion. "I truly believe education is best learned by living adventures," Jerri says. And she should know. Her life has been – and continues to be – filled with great adventures.